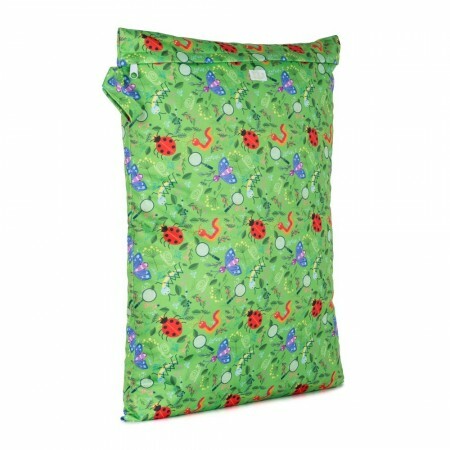 This large nappy bag fits 10-12 cloth nappies, making it ideal for storing a couple of day's worth of used nappies before wash day. You can use it instead of a nappy bucket and it's really handy for family swimming trips or days out at the beach. Made from the same waterproof fabric as your Baba + Boo nappies, this zip-up bag has a sewn in strap so that you can hang it from your bathroom door. It measures 55cm x 38cm. Wash at up to 60'C and line-dry. Bug hunters will love this nature detective print, featuring colourful ladybugs, butterfly's, worms and more all over a lovely green background.